Just got this little cookbook to review ... did I mention that it's kind of small? It's a little larger than a standard paperback novel, and kind of thin, too, but it's got "150+" recipes, according to the cover. I didn't count them, but I believe it. Slow Cooker Favorites Chicken is kind of an eclectic collection. Which means something for everyone, and also something for everyone to hate. What I thought was particularly interesting was that many of the recipes seemed to avoid wheat products, calling for rice flour where I normally would have used all purpose flour, and calling for gluten free noodles or buns. But nowhere on the cover or introduction did it say anything about having gluten free recipes. Which I thought was odd, considering that gluten free is a pretty popular niche. I mean, why not promote that? Perhaps it's because a number of the recipes rely on canned soups, spice mixes and other packaged products which could contain gluten. And some recipes did include flour. And there were sandwich recipes that didn't suggest gluten free. So, although some recipes were designed to use alternatives to gluten, many others did not. Salt was another ingredient that seemed to come and go. Some recipes used soy sauce, bacon, and canned soup mixes. Some included salt itself. Some were totally salt free. Some recipes were completely from scratch, while others used shortcuts.Some were super-simple, and some had a giant list of ingredients. Some seemed to be avoiding fat, while others included cream cheese. It's almost like the book was compiled from a bunch of different sources. Which it was. There was no author listed, but the copyright page notes that recipes are compiled and adapted from a number of other Adams Media cookbooks. Aha ... that explains everything. And there's nothing wrong with that. They own the rights to the content, and they found a way to compile a new collection that might appeal to a whole new audience. It makes sense. So I'm right back to my original thought. 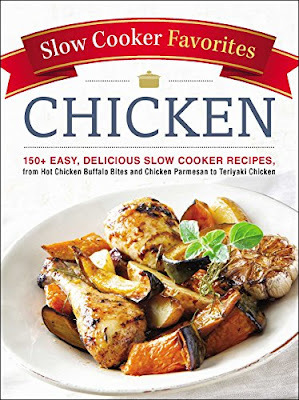 There are a LOT of recipes for cooking chicken in a slow cooker in this book. You'd have to have a serious slow cooker chicken fetish to ever make all of the recipes in this book. Or half. Or a quarter. So it probably doesn't matter that there are going to be some recipes that don't appeal, since it's likely you'll find others that are juuuuust right. If you're looking for slow cooker recipes and you love chicken, this could be a good book to browse through, either to make the recipes or to be inspired to adapt them yourself. If you're looking for a book that has one "voice" with one author's perspective, this isn't it. And there are no photos or illustrations in this book, so you'll have to use your imagination as you browse. I received this book from the publisher for the purpose of a review.